Today, someone came to look at a problem with wet walls that we’re having (blegh) which meant I worked from home today. As my job allows for entertainment on the side, and I have two monitors, I used the opportunity to catch up on HarmonQuest. What can I say? 10 episodes later I am quite excited about this show, which is fun entertainment for tabletop roleplayers. But what exactly is it? It’s an American show with 30-minute episodes, in which three comedians and a guest star (two in the finale) play a game of Pathfinder. As I am a Pathfinder GM myself, I was intrigued. The comedians are Dan Harmon (Community, Harmontown, Rick and Morty), Erin McGathy and Jeff B. Davis. The GM is Spencer Crittenden, and he looks as nerdy and metal as you would imagine a GM. The Actual Play bit is in front of a live audience, and the players aren’t eating enough snacks. I once visited friends in California and played in a Dungeons&Dragons game, and ever since, when I think of RPG in the US, my thoughts turn to eating cheetos until your fingers are orange. The cast of Episode 1. The guests each play an NPC and with few exceptions those NPCs do not survive their episodes. In the finale I finally even recognized a guest: Nathan Fillion! You don’t actually see much of the Actual Play because the cool thing about HarmonQuest is, dass all actions are shown as animation. You hear the players say what their characters are doing and see the whole thing as animation. As should be expected from a cast of comedians, it’s not serious at all, and is going for the laughs. The story offers all the tropes you could expect, as our three buffoony heroes traipse across the world to save the world, and always end up helping the villains. The grand finale of the story arc was surprisingly serious and gripping. The guest stars usually have no experience with tabletop games, but improvise quickly, some better than others. Aubrey Plaza as gnome alchemist was a real highlight in episode 5. Some jokes fall flat, some others made me guffaw. If you expect a real RPG session, as in Critical Role, you will be disappointed, because this has very little to do with a real Pathfinder game. All players have character sheets they consult, but you never find out what level the characters are or how many hit points they have. The fights are pretty cool, but don’t expect to see anyone but the GM rolling any dice or initiative or anything. This is certainly owed to the format because you can only achieve so much in 30 minutes, if you want to keep the story flowing. At least I was able to recognize the Pathfinder classes of all characters (though a paladin pirate captain was weird), with the exception of James Dean, a ghostly spirit living in Fondue’s magical broadsword in episode 9. On the other hand this means that you can enjoy this show even if you don’t like Pathfinder or have never played it. The ruleset really plays no role in this show. I was amused that Jeff B. Davis always pointedly holds up the Pathfinder core rulebook at the start of each episode. Good on Paizo for being involved while Dungeons&Dragons 5e is whittling away at their fanbase. As non-American this is not so easy. 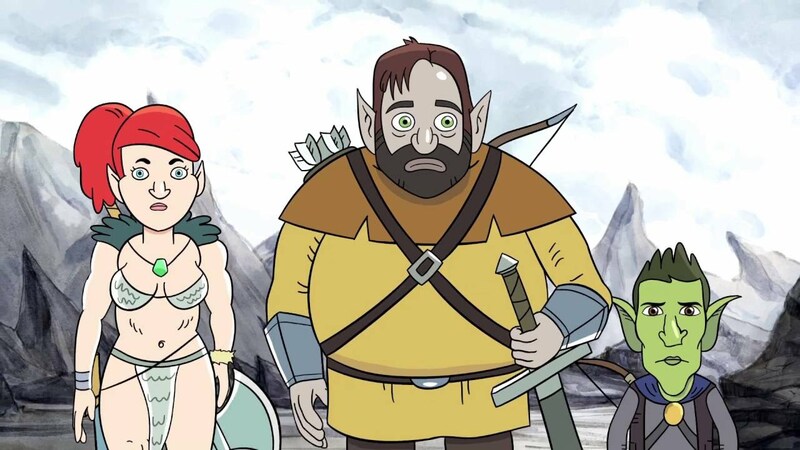 HarmonQuest is streamed on Seeso, a comedy streaming service of NBC which is only available in the US. If you are in the US and have Amazon Prime, you get a free 7-day trial of Seeso, which is more than enough time to watch all 10 episodes of season 1. There’s also trailer for season 1 on YouTube, and the first episode is available there as well. All in all one of the weaker episodes, I didn’t much care for the guest star, btw. Seeso just announced a season renewal which I am looking forward to sometime later in 2017! Summary: if you enjoy sitcoms or Improv, and like tabletop RPGs, you should be able to enjoy HarmonQuest as well. However, if you don’t care for sitcoms and take our hobby dead-serious, you should probably stay away. Andrea has read 5 books toward her goal of 42 books.